Read all the updates on election campaign for the Lok Sabha elections. # BJP announces third list of 74 candidates for Lok Sabha elections. # Leader of Opposition in Lok Sabha Sushma Swaraj to contest from Vidisha seat. # SS Ahluwali to contest LS Elections on BJP seat from Darjeeling. # Ram Kripal Yadav, who recently joined BJP after quitting RJD, to contest from Patliputra against Lalu Prasad’s daughter Misa. # Rajiv Pratap Rudy to contest from Saran. # Kirti Azad to contest LS Elections from Darbhangā on BJP seat. # BJP leader Shahnawaz Hussain to contest from Bhagalpur. 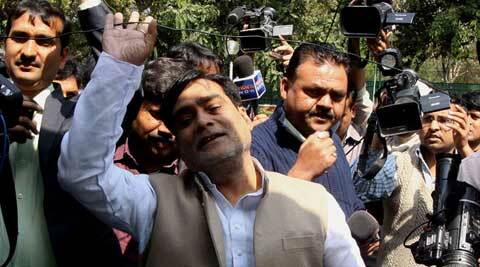 # Candidate for Patna Saheb will be decided in consultation with incumbent MP Shatrughan Sinha, says BJP. # Congress releases second list of candidates for 71 Lok Sabha seats. # Union Minister Shashi Tharoor will contest elections from Thiruvananthpuram. 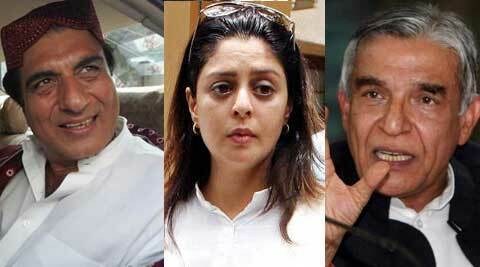 Congress fielded Nagma from Meerut, Raj Babbar from Ghaziabad and Rita Bahuguna Joshi from Lucknow. # Former Railway Minister Pawan Kumar Bansal renominated by Congress from Chandigarh in Lok Sabha polls. # Raj Babbar to be Congress candidate from Ghaziabad. # Rita Bahuguna Joshi to fight elections from Lucknow. # Congress fields actress Nagma from Meerut. # 35 per cent of youth in in Congress lists of candidates. # The second list consists of nine Youth Congress office bearers and 11 women candidates. # BJP to field Pramod Mahajan’s daughter Poonam Mahajan against Congress’ Priya Dutt from Mumbai North Central constituency. # Nandan Nilekani, contesting as Congress candidate in Lok Sabha polls, resigns as Unique Identification Authority of India Chairman. # FIR lodged against Arvind Kejriwal and AAP members for causing chaos at the Mumbai airport during their roadshow. # Former Miss India and actor Gul Panag joined Aam Aadmi Party (AAP) and will be its candidate for Lok Sabha polls from Chandigarh, a place where she was born and describes as her “family’s home”. # Panag said that the country is at the threshold of transformational change which is being led by AAP and Arvind Kejriwal. # AAP leader Ashutosh attacks Narendra Modi, asks him how can he fight corruption when he gives ticket to B Srimulu and Yeddyurappa. # “Modi gives ticket to Yedurappa who was removed from CM seat due to corruption. Modi is desperate to become PM. He can’t fight corruption,” Ashutosh tweets. # B Sriramulu to contest from Bellary in Karnataka on BJP ticket, BJP decides against merger with BSR Congress. # All India Congress Committee general secretary, in-charge of Andhra Pradesh affairs, Digvijay Singh arrived in Hyderabad on Thursday on a three-day visit to launch an exercise for selecting party candidates for the ensuing elections to Lok Sabha and state Assembly. # In what could signal end of its long-standing alliance with Congress in Goa, the NCP today announced it will contest both the seats in Lok Sabha polls. # The Congress and the BJP will release another list of candidates for the Lok Sabha election. # BJP’s Prime Ministerial candidate Narendra Modi’s constituency is likely to be announced today. # Trinamool Congress on Wednesday announced a list of 30 candidates who will be fielded by the party from Kerala, Chhattisgarh, Maharashtra, Assam and Delhi. Yesteryear Bollywood actor Biswajeet figures in the list for the South Delhi seat. # AAP chief Arvind Kejriwal on Tuesday attacked Narendra Modi over his Gujarat development story and claimed there is no ‘wave’ in favour of the BJP’s prime ministerial candidate anywhere in the country.